Just got in some shirts that are this color. 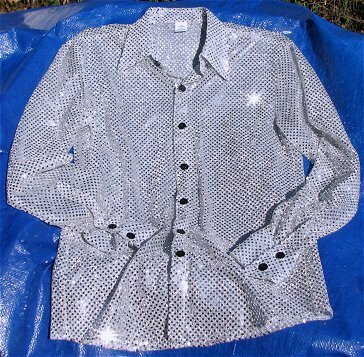 They have silver sequin dots on a white and silver metallic fabric background. These wonderfully reflective shirts should be hand washed after wearing. The shirts are wonderfully bright. If you want plenty of flash without much trouble, just pair the shirt with any pair of black pants. The chest on this shirt measures to fit a 40-42 chest. It has a slender long cut. The sleeve length is quite long, 36"
Tasteful, but flashy $ sign disco chains available at third order button.